Amy Rueffert, Log (Dog & Butterfly), 2008. Blown, solid glass, decals, vitrolite. H 11, W 11, D 5 1/2 in. 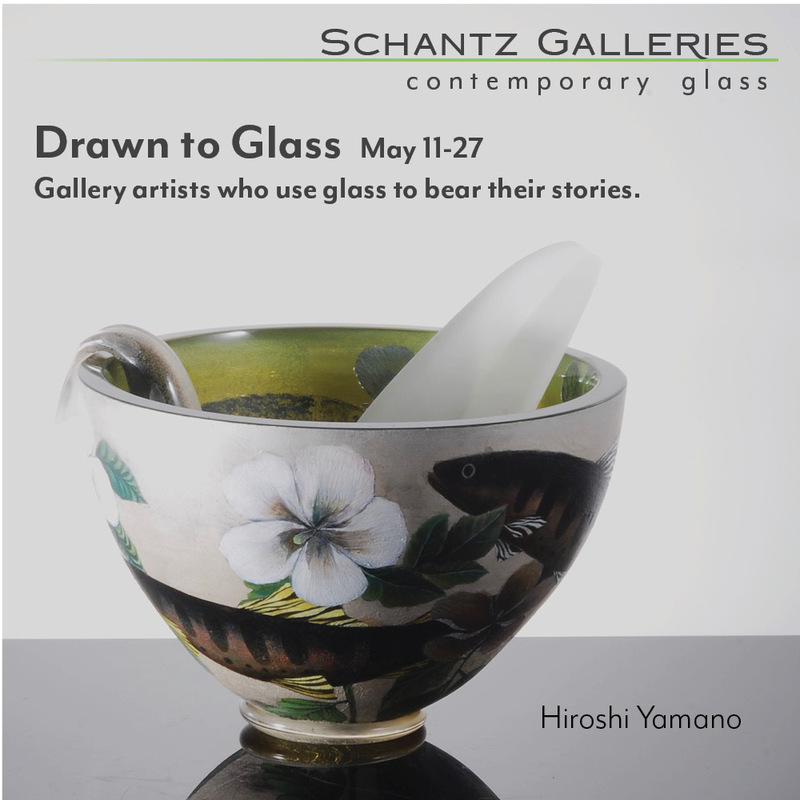 courtesy: morgan contemporary glass gallery. Walking into an art gallery, one doesn’t expect to be confronted by a teapot, two rubber duckies, a flashy handbag, watering cans, chairs, and an angry mop. 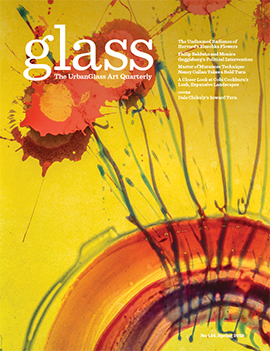 But these objects, or versions of them made with glass, will be on display at a new exhibition opening this Friday, October 8th, at the Morgan Contemporary Glass Gallery in Pittsburgh. At times playful, at times profound, the wide array of sculptures and installations, as well as functional and decorative objects, have been brought together in an exhibition entitled “domesticity: how we live.” The group show will feature the work of eleven female artists who use glass as their sole or dominant artistic medium to explore notions of femininity, gender roles, home, and the objects that inhabit it. Many of the exhibition pieces evoke two eras that were strictly governed by rigid gender roles: the Victorian era and the 1950s. Laceware (2010), Lisa Demagall’s fragile glass spoon made from flameworked borosilicate glass, recalls the lace trim popular in women’s fashion of 19th century Britain. In the same vein, Amy Rueffert looks to the Victorian curio as inspiration for her whimsical pieces made with ceramic decals and Vitrolite. A number of her pieces appear in the exhibition, including Log (Dog & Butterfly) (2008), a marzipan-like log adorned with decals and a flower and set under a pristine glass dome. Substituting glass for yarn and a hook, Cortney Boyd creates Pluma’s Potholder, a kitschy “crocheted” potholder that, aside from the medium, would blend in perfectly in many a grandmother’s kitchen. Similarly, the work “From small beginnings come great things.” — a piece by Jennifer Halvorson that features flameworked jelly jars and a small strawberry with found objects/silverware set on a shelf — brings to mind the ritual of canning fresh fruits and vegetables, so often categorized as “women’s work” in the past. By making pieces such as these, these artists often subvert the very gender politics they aim to explore. 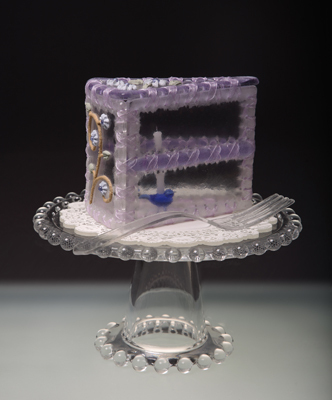 For example, Susan Taylor Glasgow‘s Slice of Happiness serves up exhibition visitors a decidedly inedible treat: a piece of glass cake. Set on a hobnail cake stand and complete with candles and a fork, the cake is meant to be looked at in a gallery, not eaten for dessert. By employing as her subject matter the ornate presentation of a whimsical confection, Glasgow toys with our notion of what it means to make a cake, and allows her to explore what she calls her “own notions of domestic role-playing.” As an artist, her workplace is in the studio, an occupation that she acknowledges takes her away from the home. Her work embodies the negotiations many contemporary women must make as they navigate the complex interplay of domesticity and femininity, which are even more highly charged for a female artist. Artists’ talk: Saturday, October 9th, 11 AM.